Length up to 300cm / Width up to 120cmPolished or Suede + sandblasted strips (Antislip)Shower traysDrain valve (ref. 312140)Silicone sealantInstallation guide and Maintenance recommendationsSlot for screen (perimeter partition with a width of 30mm)Mitred frame with a width of 40mm-----This tray can be supplied in any colour in the Silestone® and ECO Line Colour Series. 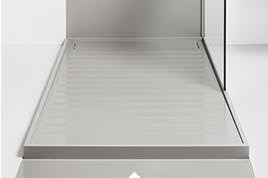 CLASS CThe tray surface has strips with a soft sandblasted finish, thanks to which it complies with the highest antislip classification based on the German DIN 51097:1992 standard.For shower trays with lengths of more than 200cm the area exceeding 200cm will be a drying area with no gradient. Length up to 300cm / Width up to 120cmPolished or Suede + sandblasted strips (Antislip)Shower traysDrain valve (ref. 312140)Silicone sealantInstallation guide and Maintenance recommendationsSlot for screen (perimeter partition with a width of 30mm)Mitred frame with a width of 40mm-----This tray can be supplied in any colour in the Silestone® and ECO Line Colour Series. CLASS CThe tray surface has strips with a soft sandblasted finish, thanks to which it complies with the highest antislip classification based on the German DIN 51097:1992 standard. Length up to 300cm / Width up to 120cmPolished or Suede + sandblasted strips (Antislip)Shower trayDrain valve (ref. 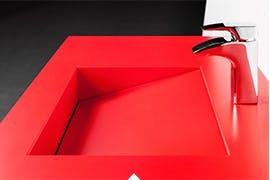 313943)Silicone sealantInstallation and maintenance recommendations guideSlot for screen (perimeter partition with a width of 30mm)Mitred frame with a width of 40mm-----This tray can be supplied in any colour in the Silestone® and ECO Line Colour Series. CLASS BThe tray surface has strips with a soft sandblasted finish, thanks to which it complies with the highest antislip classification based on the German DIN 51097:1992 standard.For shower trays with lengths of more than 200cm the area exceeding 200cm will be a drying area with no gradient.Reinforced with fibreglass. Length up to 300cm / Width up to 120cmPolished or Suede + sandblasted strips (Antislip)Shower traysDrain valve (ref. 313943)Silicone sealantInstallation guide and Maintenance recommendationsSlot for screen (perimeter partition with a width of 30mm)Mitred frame with a width of 30mm----This tray can be supplied in any colour in the Silestone® and ECO Line Colour Series. 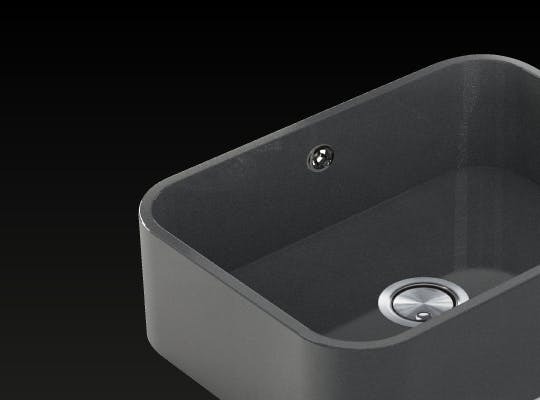 CLASS BThe tray surface has strips with a soft sandblasted finish, thanks to which it complies with the highest antislip classification based on the German DIN 51097:1992 standard.For shower trays with lengths of more than 200cm the area exceeding 200cm will be a drying area with no gradient. 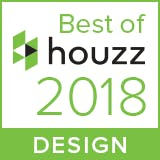 Dapur countertops, mandi meja, lantai, fasad, mandi nampan, tenggelam, ... Bahan kami memiliki berbagai possibilites.